I am a Jedi, as my father had been before me. Bring the power of the bright side to your Assault on the Empire with Luke Skywalker, Jedi Knight. 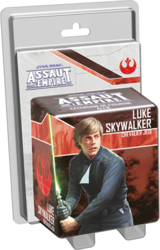 Fight alongside Luke in "A Glow in the Dark", a side mission that will fit into any campaign. This expansion also contains unpublished Command Cards and two unique Skirmish missions to play one on one. Be careful this game is an extension of Star Wars: Assaut sur l'Empire and cannot be played alone. To be able to play it you must have a copy of the game Star Wars: Assaut sur l'Empire .